It’s been a while yet again, but here I am, found some time to make a cake, yeah!!! Couple of weeks ago my kids’ godmother asked me if I ever made Esterhazy Cake. I didn’t until now, and I remembered my dear foodie friend Marija of Palachinka Blog (this links to recipe) did, so I paid her blog a visit, and promised myself I would make it. 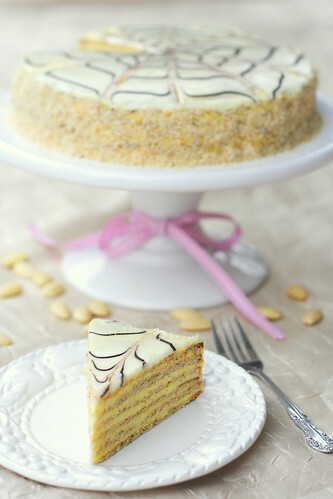 Toasted almonds, and vanilla cream sounded heavenly, and I can’t believe I never made this cake before. I was a bit hesitant to commit myself to making 6-7 biscuit layers, but I just bought a pretty large Amish table, so I had no excuse, had plenty of surface to work on. I was intimidated with making the white cake mirror with raw egg white; don’t really trust the eggs from the grocery store, so I opted for plain powdered sugar with orange juice instead (200g powdered sugar + 5 tbs freshly squeezed lemon/orange juice), and of course it gave me different results, and the cake isn’t as pretty as Marija’s. However, I am pretty sure that my impatience had a lot to do with it as well, as I hurried to make the net, and the whole thing started running down the sides; that was the moment I have instructed everyone to move out of the kitchen/dining area!!!! All was great though, the next morning, when I finally tasted the darn thing, and decided I have found another favorite! The whole family loved it, and that’s rare, usually someone stays reserved. Please consider making this cake, it is absolutely scrumptious!!! Majstorski odrađeno Melita, i ja ju već duže škicam pa sam se dvoumila jako kocke ili tortu, ali doći jednom na red, a s obzirom da u tvoje recepte imam potpuno povjerenje napravit ću je po tvom, a o tom javljam!! Prelepo odrađeno. Ja je pravim sa prepečenim lešnicima, a ova sa bademom mora da ima potpuno drugačiji šmek. Sigurno je drugačija! Moja omiljena torta. Bravo za ovu tortu ! Majstorski si je napravila i izgleda jako lijepo, prekrasno . Sviđa mi se što je sa bademima ! mmm nefis görünüyor afiyetler olsun. Super izgleda. Drago mi je da si se vratila na blog! What's the difference between your cakes you have posted?! It looks like one is with almonds and the other one with walnuts, but the creams look pretty muchthe same? Aren't they related some how?! Most cakes are similar if that's where you are going with your comment, there's biscuits, with or without nuts, and cream, mostly vanilla or chocolate, and some variations in how they are prepared, and/or assembled. If you need any help, or more input on a specific recipe, I’d be glad to help. Fantastic cake. Beautifully presented and executed. It is gorgeous (like everything you make!) an well worth the wait! Sviđa mi se kako si izbegla belance u glazuri, na slici se uopše ne primećuje, a ukus je, verujem, još bolji. I was referring to Bohemian cake (walnut layers) and this one (almonds).To me they all are...nuts:) But I got your answer.Creams make the difference. I'll make both of them and see the difference. That torte is magnificent and so perfect! Wow.